Hello and welcome to another edition of Sealed Success! With the two week gap after the current leagues end and the start of War of the Spark Limited I thought it best to leave that two week gap empty as is. I would only be adding pressure to myself by condensing what would normally take me 4 weeks to do in perhaps a 2 week period. I schedule my sealed leagues in their current form to not only make it easier on myself in terms of how many videos I make per week, but also to allow for interaction and reflection during certain points in the league. Having a fresher set of eyes and perspective on either the pool or play patterns can help me make better decisions or reaffirm what I already know. I also get to break down matches a little more closely than if I were to summarize an entire leagues worth of matches in one sitting. Because of all this it doesn't make sense to me to get away from all that to crunch in material to fill in dead space. Instead it's for the best to take those weeks off and prepare for War of the Spark and make the review the best it can be. With all that said, let's take a look at the upcoming schedule and play some games. There are packs in which you find a strong card and try to draft around it as best you can, and then there are packs where all the cards are about the same power level and you have to decide which direction to go in. In the first instance you have a relatively easy draft plan of building around the card and if it's not there you pick the other open colors. However, in the second instance it's much harder to do so if all the cards are about equal and they're spread out in different colors. Perhaps someone else would have had an easier time with this but I did not due to trying to remain open while needing to commit to a plan. 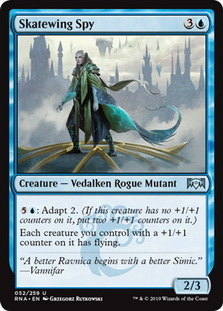 Part of me wants to remain open early in Ravnica Allegiance since I don't have the comfort level required to force a guild, but if you're open for too long you miss the opportunity to commit to something and send the right signals. This was my internal struggle early on and it came to a head when I saw the 5th pick High Alert . 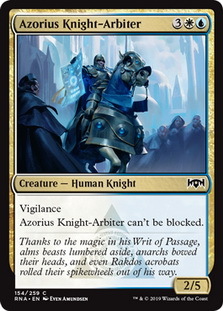 At this point it's going to be damaging to me to remain open and by picking up High Alert I can have some confidence my fellow drafters will undervalue Senate Courier Azorius Knight-Arbiter and Humongulus and leave those available for me to draft. This pick gave me a plan and some certainty that it would work out. Of course I've never actually drafted this deck and while I know what it looks like to some degree, knowing how it functions with/without High Alert is something I don't have experience with. I'm also less experienced in drafting Azorius well, I'm more familiar with Orzhov and if I"m drafting white I tend to lean that way. The matches played out in a way where I never drew High Alert and the majority of games I played turned out to be rather one sided. 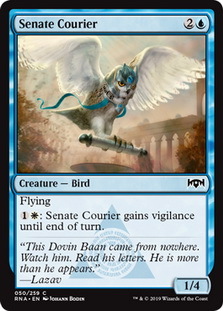 I know High Alert decks work, but there has to be something more to it than playing Senate Courier and Azorius Knight-Arbiter .dek. Have you drafted this deck? What makes it tick? If I could change anything about this match it would be how I approached the second game and perhaps I would have fared better as a result. 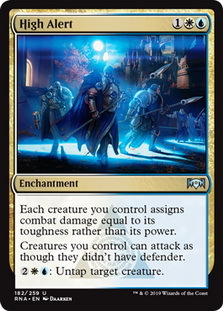 My thought process was my opponent is likely a slow control deck, so if I'm able to land Guardian Project and then make trades while drawing card I can overwhelm them with my creatures. It didn't pan out that way with my opponent putting pressure on me every turn and by the time I wanted to switch tactics and keep up with their pace of play it was too late for me. It's completely possible even with a change of play I would have lost but it's better than playing the wrong strategy. We're 1-1 and next week I'll play the final three matches to see how the league ends. The good news after this stage is we finally took a match in our favor, the bad news being we only took one match in this stage leaving us with a 1-5 record. As I stated in the videos the way this deck wins is by having Ethereal Absolution out as the trump card to give me an advantage in combat while generating threats for me to attack with. The deck is filled with creatures with decent defensive capabilities and a good enough removal suite to prevent things from getting out of control, but if the stars don't line up for me it's going to be a rough outing. My other options aren't much better in my opinion, Gruul and Simic have no removal while Rakdos doesn't have a good top end and would be prone to bad topdecks. 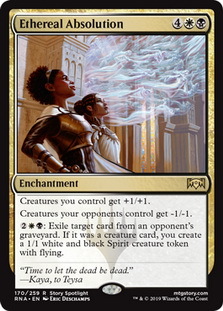 A good rule to follow in Sealed is to play your bombs and removal, which for the most part leaves me to be some sort of Orzhov deck to play Ethereal Absolution . The extra pack from stage one did help me a bit as I got to upgrade some spells in my deck but the overall issues weren't addressed as there really isn't a way for me to do that. Every deck I have in the pool has at least some issues and I feel playing this deck gives me the least amount of issues and the best chance at winning games, even if I know I'm likely going to lose. 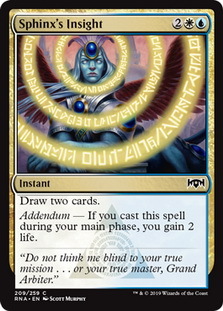 The second pack we got doesn't help me much other than consider a blue splash for Lawmage's Binding , Sphinx's Insight , and perhaps Skatewing Spy . It's going to be a tough going in the last stage of the league but with a 1-5 record we should hopefully get matched up with other equally bad decks and maybe get some wins. I didn't do a whole lot of winning this week and while some of that was a bit out of my control, the rest of it is understandable and despite not being able to fix it, knowing why it happens is useful. It's a bit easy to figure out why we win games, but it's a lot harder to fully understand why we lose them. This may be because we tend to try and blame external factors and fail to be introspective and find fault with ourselves. I know how my decks can/can't win generally speaking and whichever way the match goes I can see why it happened. With my Ethereal Absolution deck I need games to go a certain way and if I can't make that happen I'm in such a disadvantageous position that I'm very likely to lose. With the Gruul deck I need to be able to curve out and have my opponent slip up, and with the High Alert deck I need to actually play it. Knowing how you lose can help you realize what exactly you need to do be doing to win.